Earl, the owner of Azure Charters & Tours, reached out to us a few months ago for several services that we offer. First on his list was getting a logo created. We previously finished this logo quite some time ago. Once the logo was completed, he wanted to get a website created and have us host the site. The site includes four pages, social networking integration, a basic contact form, mobile device compatibility, and website statistics. Once Earl was able to provide some photos he wanted to use on the site and the text information, we had the site completed within 48 hours. Due to some email issues, he had a delay with receiving our messages but responded and said the website looked great and it was approved! We appreciate the business from Earl for all of his website and graphic design needs. 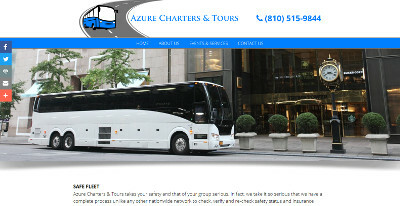 Azure Charters & Tours can be found at azurechartersandtours.com.